Originally written for The List. Go looking for a snack in Edinburgh city centre during August and you might just stumble upon some unexpected art. 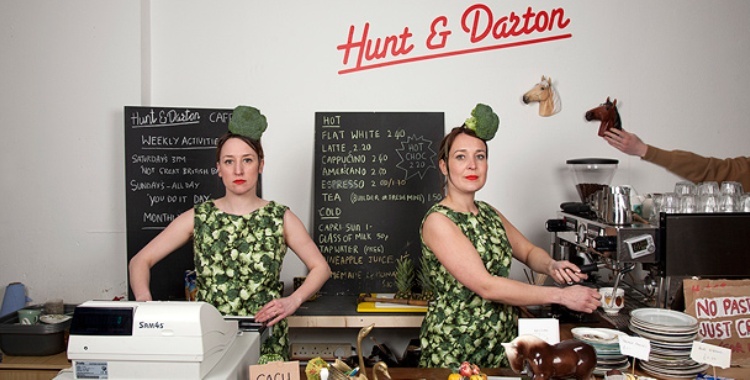 For a second year, live art duo Jenny Hunt and Holly Darton are offering festival-goers food for the stomach and the eyes at the Hunt & Darton Café, their unique pop-up installation on St Mary’s Street. The idea behind it, Darton explains, was that ‘a passerby might just come in wanting a simple cup of tea and a cake and before they knew it they were involved in the installation’. The café first opened in Cambridge in April 2012 as part of the Cultural Olympiad, and has since visited Edinburgh and East London. The pop-up venue will be back at the Fringe this year, offering the addition of a bar in the evenings and an expanded programme of performances. ‘It became much more political than we realised,’ says Hunt, describing how the café unexpectedly transformed into an alternative, artist-led venue on the Fringe. In 2012, the pair was amazed by the huge response from artists looking for somewhere new to present their work. This year, that demand has been satisfied with a varied evening line-up, which Hunt and Darton hope that they are ‘framing slightly differently by it belonging to the café’. As well as ‘shamelessly’ programming themselves, the pair have invited shows such as Chris Dobrowolski’s performance lecture All Roads Lead to Rome and Richard DeDomenici’s Popaganda, a piece that’s ‘very much about the now and popular culture’. But the art is by no means confined to the performances. ‘We say that every element of the café is art,’ Darton explains. ‘There are never any paintings on the wall or anything, because we don’t want people to be like – that’s the art!’ So the waiter serving you might be a performer, while everything down to the salt and pepper shakers has been carefully designed. Even the menu is something of a statement. ‘We thought quite long and hard about how creative we wanted the menu to be,’ Hunt admits, explaining that they eventually settled on an aesthetic that reflects their personalities. ‘We’re both born in the 80s and a lot of it references our childhoods,’ says Hunt, while Darton chips in to describe it as ‘comical, performative and kitsch’. Popular dishes include Battenberg cake, bowls of Coco Pops and their signature roast dinner sandwich.